The buildings of Melenos Lindos Hotel follow loyally the architectural styles of Lindos from the 17th century and the premises resemble to a micrograph of the rest of the village with white and sandy beige being the two leading colours. The hotel has numerous wooden constructions all of which created by local craftsmen using wood from Rhodes. All you see around you is handmade. Traditional architectural designs have been applied to all of the 12 suites of the hotel, without missing out on any of the contemporary standards. The experienced architect Anastasia Papaioannou and the notable artist / designer Donald Green thrived in both its interior and the exterior. Light brown wood combines with brightly coloured fabrics yielding an interesting outcome within the suites, whereas in the communal areas you will be surprised by the plethora of details that elevate the hotel’s overall aesthetics. Elegant stone facades, handmade ceramic decorative creations, elaborate woodwork, amazing mosaics out of marble and pebbles, beautifully painted wooden ceilings to mention just a few examples. The hotel’s restaurant offers an inspirational menu with dishes influenced by Asia Minor. The chefs at Melenos Restaurant practice rare recipes using local goods which will satisfy your appetite for enticing flavours from a different epoch. The restaurant’s setting is characterised by medieval decors, notorious pebble mosaics and spectacular views to the Aegean Sea. 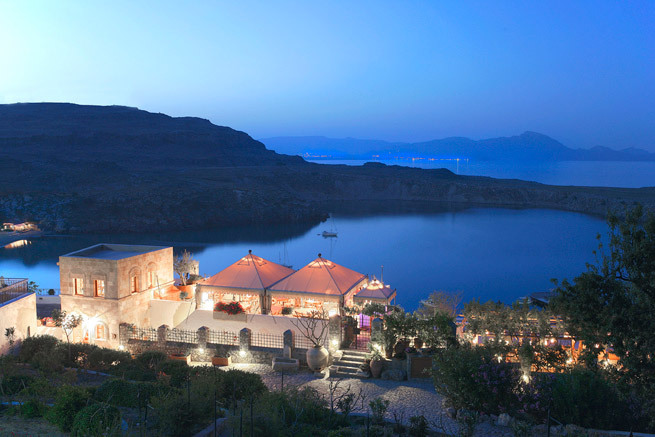 Lovers of the culinary arts will find the cooking courses by Melenos Lindos very appealing too! Do not omit to spend some time in the hotel gardens and make them your favourite hideaway especially in the afternoon hours. A panorama of the Aegean, blooming pergolas and soft cushions on comfortable wooden ornate furniture and sofas will delight you. Accompany your times at the garden with inspirational cocktails, refreshing juices and culinary delights and just enjoy the sweetness of pure relaxation. If you are a collector and interested in buying local creations in your travels, then you should visit the hotel’s gift shop ‘To Fouli’. With the owner being a collector himself, his idea of opening a shop within the hotel premises attracted a lot of interest from guests who love it for its wide variety of valuable ornaments, fabrics and other decorative objects from Greece, Turkey, Italy, Syria and other parts of the world. You will be spoilt for choice and might find it hard to stick to just a single buy! Then again, you can always come back again and again, for more beautiful buys that will only enrich the memories of your delightful stay at Melenos Lindos when you are far gone.